Coaches: Notre Dame — Brian Kelly (12-7, second season), USC — Lane Kiffin (13-6, second season). Series Facts: This will be the 83rd meeting between the two schools. Notre Dame leads the all-time series 43-34-5. Notre Dame’s 20-16 victory last season in Los Angeles was its first win against USC since 2001. The Notre Dame Fighting Irish (4-2) take on the Southern Cal Trojans (5-1) under the lights at home in South Bend on Saturday to contest for the jeweled shillelagh. With the exception of Stanford, this will be the toughest test on the remaining schedule for Brian Kelly’s boys. The Irish enter the game freshly recharged off a bye week to take on an equally talented USC. If the Irish run the table for the rest of the season then they are a lock for a BCS Bowl berth. No such aspirations are in the mix for USC who are serving a post season NCAA imposed ban for the Reggie Bush scandal. Last year saw the Irish roll into the LA Memorial Coliseum and hand the Trojans a 20-16 loss that snapped an 8 year Trojan win streak against Notre Dame. That game was played with both starting QB’s sidelined in Dayne Crist and Matt Barkley. Dayne will be on the sidelines again this year, giving way to an improving Sophomore QB Tommy Rees. Many Irish fans throughout this electronic world are wondering and guessing what way the Irish will turnout for this game.....in more ways than one! Notre Dame will feature brand new helmets for this game. They will be a much shinier gold to represent a more accurate resemblance to the Golden Dome. There is also wide speculation of an appearance of the Green Jersey or perhaps even a brand new one. This game is huge in terms of recruitment to ND, and it will see at least 2 dozen future prospects visit the home sideline for the contest. Among the 5 star visitors to the sidelines on Saturday night will be 6-8 285 DL/OL Arik Armstead. Armstead recently de-commited from USC and is very much looking forward to visiting the campus of Notre Dame. Armstead joins the nations top running back in 5-11 195 Keith Marshall, 6-6 295 OT John Theus and 6-2 210 Shaq Thompson. News just hot off the press suggests that the number one QB in the nation, Gunner Kiel, who recently de-commited from the Indiana Hoosiers, is pegged to be on the sidelines of this game. So as you can see, this game means a lot more, for both teams, than just another notch in the W column. This is the Fighting Irish & Trojans recruiting “Super Bowl”, and has been for a long time. An early blow for USC right here, in that fifth year senior Marc Tyler, who has 83 carries for a team leading 368 yards and 2 TD’s, is listed as questionable. Should Tyler fail to start, the Trojans will look toward Junior standout Curtis McNeal. McNeal is an explosive back who is averaging over 7 yards on 28 carries. There is no way in my opinion that USC hammers the ball up the middle against the Notre Dame front seven. Instead the Irish LB Corps better have their skates on as I believe that the Trojans ground game will be attacking the perimeter with their speedy backs. I cannot see USC running over ND in this one....at least not to the point of making any real significance. It has been Notre Dames crutch all season long, the Pass Defense. USC have their own version of Michael Floyd in Robert Woods. Woods through six games has amassed an incredible 60 catches for 783 yards and 6 TD’s. USC will be guilty of not doing their duty if they cannot get a one on one match-up between Woods and CB Gary Gray. Gray is widely regarded as the weakness in the ND secondary.....he will be tested on Saturday for sure! This is not the same USC offensive line that the Fighting Irish defense would have faced in passed encounters. However, it will be the best OL that Freshman Aaron Lynch and Stephon Tuitt would have faced thus far. The USC front seven is extremely inexperienced, but still talented nonetheless. Led by fifth year senior LB Chris Galippo, the Trojan run D has held opponents to under 100 yards per game on a 3.4 yard per attempt average. Flanking Galippo in the LB corps will be a set of impressive freshmen in Dion Bailey (48 tackles) and Hayes Pullard (35 tackles). These guys have the talent, but lack experience on the edges. The Fighting Irish tandem of Ceirre Wood and Jonas Gray has been nothing short of amazing this season. The Brian Kelly version of Thunder & Lightening are averaging almost 200 yards on the ground per game at an amazing 6 yards a pop. Gray has an amazing 8.4 yards a carry this season and is on pace to eclipse George Gipp’s long standing average per carry record. Another big loss for the USC effort here by way of a broken ankle suffered by Redshirt Freshman cover corner Anthony Brown last Thursday versus Cal. Brown is widely believed to be one of the best in an otherwise underachieving SC defensive backfield. The Trojans have giving up almost 300 yards a game this season and will need to focus on confusing Tommy Rees in much the same way that Pittsburgh did earlier in the season. If Rees has another turnover free game, the chances of a Brian Kelly victory go up ten fold. For that to happen all eyes will be on the matchup in the trenches. No team has come out and smacked the Notre Dame offensive line in the mouth thus far this season.....and I don’t see this changing on Saturday. If there is one big advantage to be had by USC, it is in the special teams matchup. The Irish punt return game is non existent this season, ranked 120th in the country and averaging on the minus side per return. Notre Dame’s punting game is nothing to write home about either, averaging a less than respectable 37 yards per boot. David Ruffer is just 50% on his kicks so far....he had missed one last season as a walk-on. The Irish may have Michael Floyd on PR duty for this game, so all eyes will be set on him to see if he can emulate the great return games under the lights of yesteryear. Brian Kelly has been striving for offensive balance this season and when you consider that Notre Dame ranks 29th in run (194 yds pg) and 30th in passing (274 yds pg), he has managed to achieve a very, very difficult offense to defend against. He has also managed to blend very young players into a top defensive outfit....something that had long been sought after since the Davie era. The team are well rested and focused on the task at hand. Let’s face it.....this is the biggest game on each teams calender, you are fooling yourself to suggest otherwise. Every USC fan and their mother, would love nothing more than to knock off a potential BCS bound Irish team and I believe Coach Lane Kiffin will pull out all the stops to make it happen....but he will fall short ! • According to Notre Dame head coach Brian Kelly, senior defensive end Ethan Johnson will be available for Saturday night’s game. Johnson suffered an ankle sprain early in the Oct. 1 Purdue game and sat out the Oct. 8 Air Force contest. He is listed as a co-starter with freshman Aaron Lynch on this week’s depth chart. Luther Bradley and Reggie Brooks. Ted Robinson will serve as host, and there will be a historical video piece on the Notre Dame-USC rivalry. • Former Irish Heisman Trophy winner Tim Brown will speak at the pep rally Friday night before the USC football game (6:30 p.m. at Irish Green). • Sprint has provided more than 80,000 blue rally towels to be handed out to all those attending the Notre Dame-USC football game on Saturday. 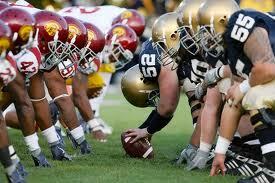 • This is just the 10th time both USC and Notre Dame entered the game unranked. The Irish are 7-2 in such games, most recently last year’s 20-16 victory at the Los Angeles Memorial Coliseum.